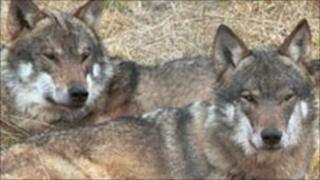 The Princess Royal has opened a new enclosure for two European grey wolves at the Highland Wildlife Park, Kincraig. Costing £300,000, Wolf Wood was built with help from the Royal Engineers. In April, a wolf broke out from the old enclosure and was later tranquilised and recaptured. Afterwards, animal collections manager Douglas Richardson said pet hamsters posed a greater threat to the public than the escapee. The enclosure officially opened by Princess Anne is home to female wolf Elara and newly-arrived five-year-old male Puika. In May, Alladale Estate in Sutherland shelved a plan to introduce four wolves from Romania into a secure area. The proposal was dropped in the interests of the animals' welfare. General manager Hugh Fullerton-Smith said it was still the long-term ambition of the estate to introduce wolves, but into a much larger area.